Jamsek 1887 wines are the best regional wines, proved by many national and international wine competitions, picked by hand. Our estate can be found in the pretty village of Manče on the slopes of the sunny Vipava valley, which connects northern Italy with central Europe and is the perfect elevation and temperature for wine production. We are proud of our antique oak barrel, dating from 1887, which we still use to mature our wine! The barrel date is the only official record of a long tradition of wine producing here, but local legend confirms that this noble craft has been practiced on the farm for much longer. On the Jamšek estate we cultivate 6 hectares of vine. We also specialize in two lines of top quality wine. Firstly, fresh white aromatic wines which are very drinkable and secondly, wines fermented on lees in oak barrels using the “sur lie” method. We are delighted that our wines have been recognized with many awards from the Slovenian home market over several years and we have also had international competition success. Please find an introduction to the different vintages we produce at Jamšek, we look forward to welcoming you also for a tasting! We already tasted a lot of good white wines in the Vipava Valley, but these wines were far superior. If you are looking for some great reds Jamsek is the place to be for this, but not only for red also the whites and of couse the orange wine. Jamsek 1887 wine estate has a log tradition, but as a company with three people in charge exist just from 2006. From zero we are now able to sell 15.000 bottles per year. On a global level we are recognized as boutique sellers. 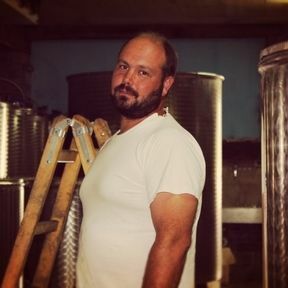 The members of dream team are Ivan (the owner and person responsible for all the work inside vineyards). Marko, a graduated wine produce, responsible for wine cultivation in a wine cellar. Erika is sale manager and leader of wine tastings and web shop. You are welcomed to visit us at Jamsek 1887 wine estate in Vipava Valley, Slovenia. Wine purchase and wine tastings must be booked ONE HOUR in advance!